President Xi - the next Nobel Peace Prize winner? We’ve all been to one. A dinner party where a mutual friend has tried to bring together some friends with the aim of expanding friendship. Conversation is a little forced after initial pleasantries, and often a few awkward silences start to emerge. So here is a suggestion if you get to this point next time: suggest that former President Obama should never have gotten the Nobel Peace prize in 2009. Rather, the Chinese Communist party was the true worthy recipient for services to humanity and peace on earth. How can I justify this outrageous claim? Because over the last 40 years, no other single group of people have raised from poverty as many people in as short period of time in the history of humanity. The risks of instability or war to the world from having over 1bn people still in poverty today would have been greatly magnified, let alone the human costs that poverty brings. I raise this point because this weekend saw President Xi meet with President Trump against a backdrop of rising protectionism globally and the USA, the traditional leader of free trade, refusing to sign commitments to free trade at the G20. How did we get to this point of the principles of free trade falling apart? The Heckscher–Ohlin theory is the basis used by many economists, and one conclusion is that production will move to where labour is cheap, and capital will flow where returns are high. Most people know this part. 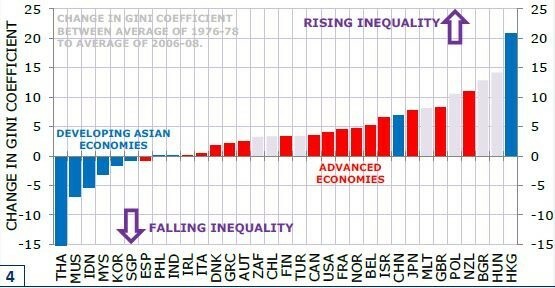 The second part is lesser known: that global inequality will fall (the world as a whole is better off), but inequality will rise in some countries. It is the latter part which governments have failed to manage. Interestingly, Denmark, a small open country more exposed to the winds of free trade than the USA, has a lot of government programmes in place that have seen their measures of income inequality remain unchanged, despite facing the same globalisation effects. It is the fallout of cheaper capital (leading to automation) and jobs moving to countries with cheap labour that the western world is now dealing with, having failed to address the issues for 20 years. How Western governments react will matter to all investors. Both equity and debt investors have done very well out of these globalisation trends of the last 40 years. Equity investors have benefited from better margins (less spent on labour) and lower tax rates. Debt investors have benefitted from the move from inflation to disinflation to now deflation, which have sent yields from 18% to below zero. For equity investors, they will need to rethink a lot of what they have learnt over the last 30 years. For example within US banks “Wall Street” (global investment banks) may continue to suffer relative to “Main Street” (regional US banks). Companies with global supply chains, such as Wal-Mart, will have to re-think sourcing. Investors may want to focus on auto companies that “near-source” rather than import. Indian outsourced IT providers such as Tech Mahindra and Tata Consulting have been incredibly profitable for investors – but they are now squarely in the sights of the US Administration. It is these sort of questions that our firm is asking of our investments increasingly and why businesses that were previously thought as excellent may not be the winners in a protectionist future. A breakdown in the relationship between Xi and Trump will hurt China as well as the USA in the medium term, but perversely Australia could be one of the biggest losers. As a small open economy, our economy does best when global GDP is growing, and we do particularly well when countries industrialise due to agricultural and mining exports (1890s/1950’s/2000’s). My hope is that President Xi recognises the situation in the USA (even if it is somewhat self-inflicted) and the USA addresses issues through targeted programmes. But exacerbating matters, we are also confronted concurrently with rising risks of climate change which will require a global solution to a global problem. My firm is attempting to address this through a new sustainably focused fund, which looks to invest in businesses that are helping assist the move to address climate change, but if co-operation and movement of capital break down, it becomes increasingly difficult for the world to solve what is a global problem. History, unfortunately, is not particularly encouraging. Using one measure of globalisation, the world today is as globalised as it was in 1910 after the USA entered global markets. The two world wars in the thirty years after 1910 did not reflect well on humanities reaction to the end of the last great round of globalisation. Maybe the solution is instead to give President Trump the Nobel Peace Prize?